Palisades jumped into the fray of mini-figures in 2004 with the release of their 'palz'. Palisades, palz...get it? Yea, I know. Their figures are slightly sculpted - usually the hair, sometimes some clothes - and most closely resemble the mini-mates from Art Asylum. They are better slightly better articulated though, with a design that allows for more range of movement in the hips and shoulders. 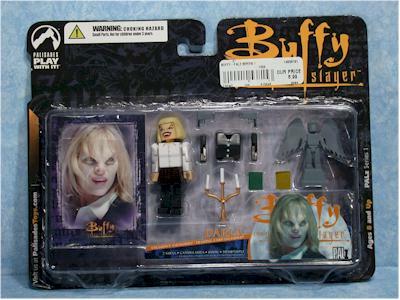 They are also designed to come apart to swap and play, something that Palisades really exploited with the first release, Buffy the Vampire Slayer. There are eight figures in the first series - Buffy, Willow, Giles, Xander, The Master, Darla, Vampire Buffy (Wizard exclusive), and Angel (Previews exclusive). 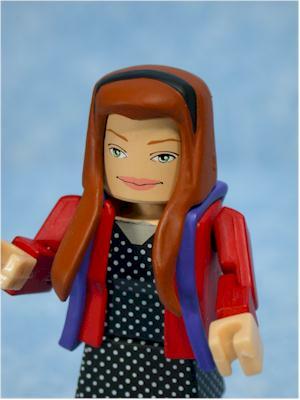 There's actually a ninth figure, a Darla paint variant, that comes in the regular cases. I've included her as the packaged shot. We'll see the palz in use again very soon with the X-Files license, which should be hitting in the first quarter of 2005. You can pick up the regular figures (including the variant Darla) at stores like Media Play, Suncoast or your local comic shop. The Vamipre Buffy is now shipping from Wizard, and Angel is a Previews exclusive, so most comic shops and online stores will have him. Because of the 'transforming' feature on these figures, I've shot a LOT of photos. 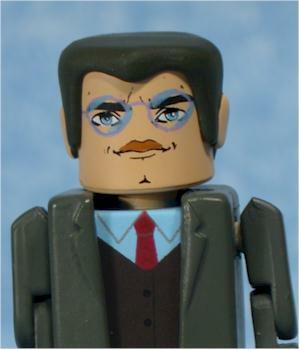 The figures are packed with extra body parts and have an additional face painted on the back side of the head to allow you to create a second figure by swapping pieces. The face shots at the top are the regular faces, and I shot each regular appearance with the accessories. There is then an additional photo showing the 'transformed' version of each figure, and finally there's a couple extra shots just for the hell of it. This first series of figures is based entirely on season one of the show, and most of them on specific looks from specific episodes. 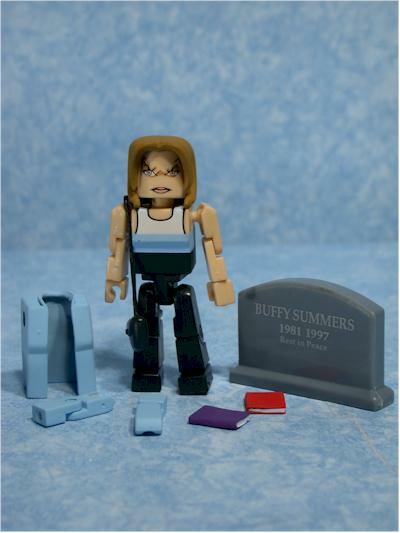 The second series of Buffy has been announced as a Season 2 Buffy (notice how the figures are designed by season? ), Oz, Jenny Calendar, Cordelia, Drusilla and Spike. The packaging is very attractive, with a nice design that uses the figure and accessories themselves to do most of the selling. They are also fairly small - at least front to back - and will make for easy storage for the MOCers. And unlike clamshells (which would have been serious overkill here), they are nice and easy to open up. There's not a ton of sculpting here, relying rather on the paint ops to define the character. All the figures have sculpted hair, except for old cueball The Master. Some also have additional pieces of clothing, and everything fits tightly without being impossible to remove or adjust. The ears are sculpted on the hair, not the heads, to make it easier to swap parts around. The figures stand about 2 1/2" tall without the hair, so most of them fall just over that, making them slightly smaller than the full size mini-mates, but slightly bigger than the small mini-mates. 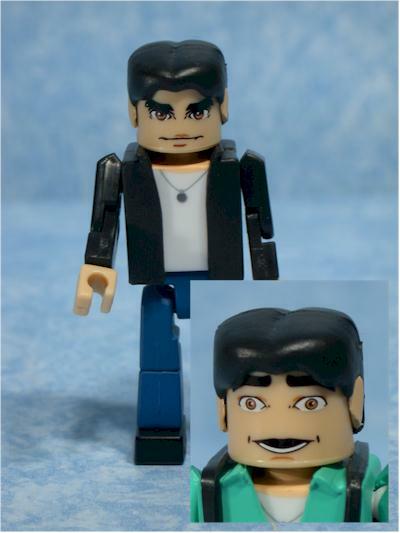 I've included a comparison shot with various other mini-figures at the end of the review. While there isn't a lot of sculpting, what's here works well. They've done a great job capturing the basic essence of these characters, in such a simplistic and minimalist style. The faces on the figures are painted, and are essential to making these little figures work. Each head has two faces, one on the front and back. 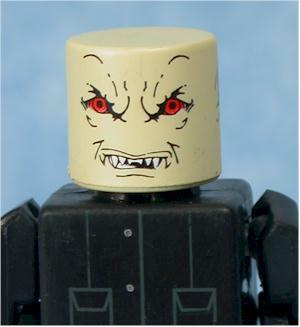 The front head is usually the 'normal' look, while the hidden transforming head is some sort of alternative look. For characters like Darla, Angel or Vamp Buffy, they are vampire faces. For characters like Giles or Willow, they are faces specifically designed to work with their show specific transformations. The paint ops are extremely clean and neat, especially on the faces and small details, like the pendant on Xander or the tattoo on the back of Angel. I was particularly impressed with the skeleton painted on the Masters clear body. The detail work is excellent, and they even manage to pull of the complicated vampire appearance fairly well. That's really the only place where the figures lack a little - the vamp faces - and it's simply because the complex 3D makeup doesn't translate well to a simple 2D drawing. They gave it an admirable attempt though, and you'll get the drift even if it's not a perfect match. 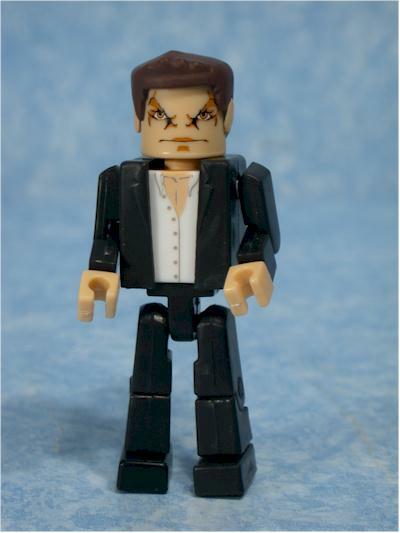 The articulation is very similar to other mini-figures out there, especially mini-mates. There's neck, shoulders, elbows, wrists, waist, hips, knees and ankles. 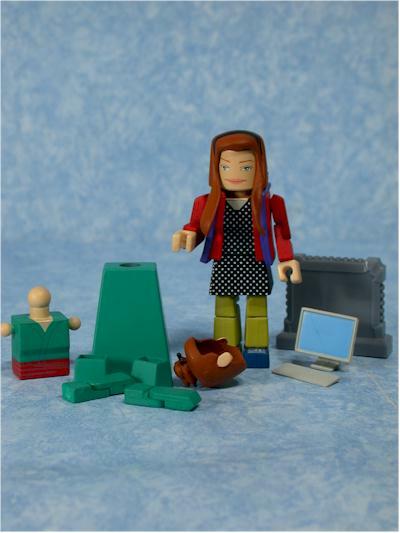 These figures are actually designed to come apart EVERYWHERE, including the knees and elbows. That's unique, and allows for some very interesting combinations. I did have a little trouble with a couple of them keeping the knees attached when I was moving them, but for the most part the pieces fit snugly. The shoulders and hips are also designed to have a pretty good range of movement, better than most other mini-figures on the market. 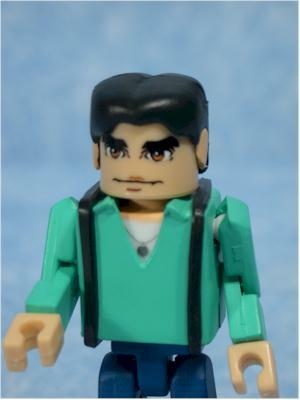 Each figure comes with a bunch of regular accessories, along with their transforming parts. Each figure also comes with a specific Inkworks trading card, based both on the character and the specific episode they were going for with the character design. 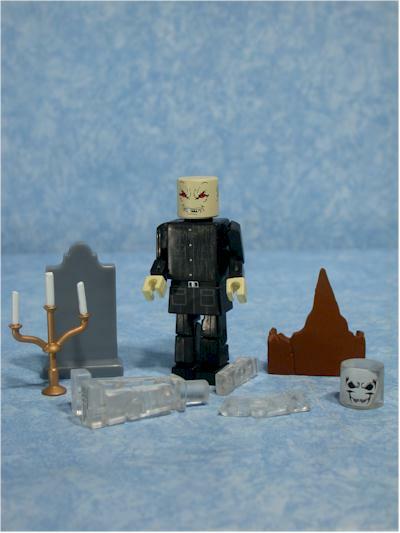 Every figure comes with a tombstone too, so you can build your own cemetery. None of the tombstones are marked (with the exception of the Vamp Buffy version), but all are completely different designs. Buffy has two stakes, a book, a pool cue, and tombstone. She also has the torso, arms and hair for her transformed version. Willow has a tombstone, monitor and keyboard, and backpack that fits nicely on her torso. 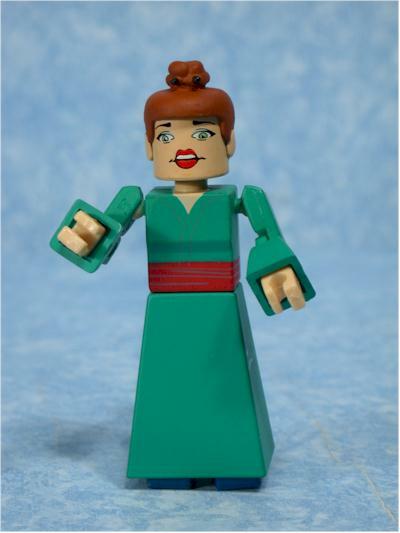 Again, she has different arms, hair, torso, skirt and cuffs to transform into her Asian appearance from the episode "Nightmares". 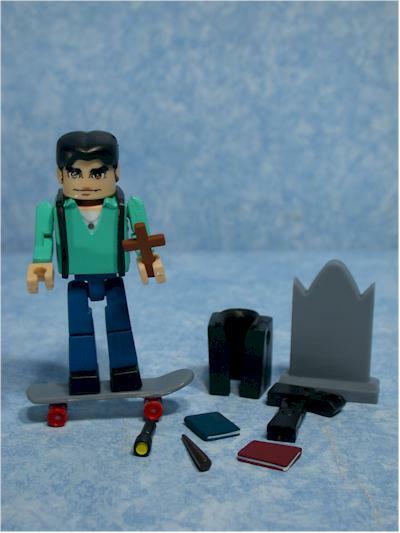 Angel has a tombstone, which is really his only non-transforming accessory. 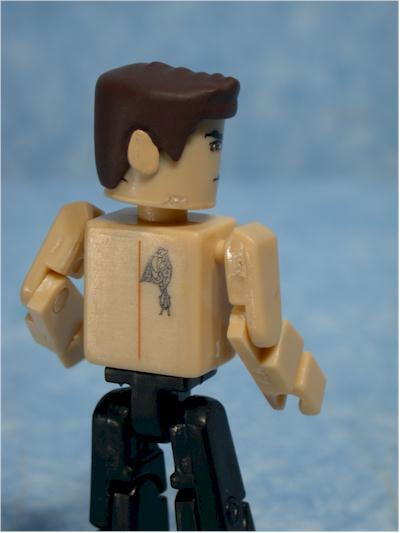 He also has two torsos - one shirted but without the cross around his neck, and one naked - and two sets of arms, one naked and one in black to match the jacket. That gives you at least six different possible looks for Angel! Darla has two books (same as Buffy's), two guns, a tombstone, and a candelabra. She also has a sweater and additional arms for her transformed look. Of the tombstones, hers is the coolest, being an angel. However, this angel is designed as though it was also a smaller version of a Palz, which is a great touch! 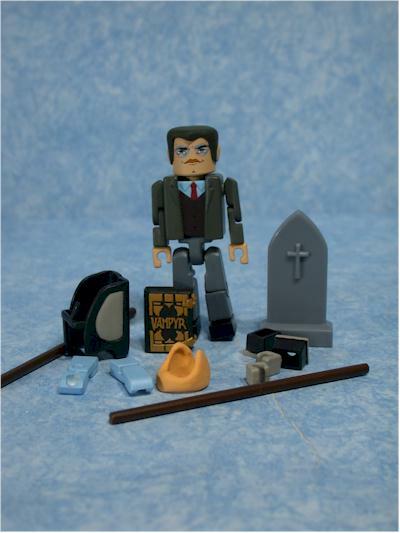 The Master comes with another tombstone, the same candelabra as Darla, and the big chunk of wood that was his undoing in the season finale. 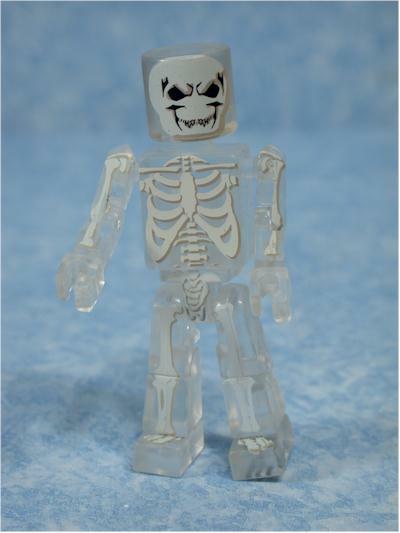 He also has a clear head, arms and legs to make his transformation into dead skeleton complete. Xander has a skateboard, backpack (which fits great and is different than Willow's), two books, cross, stake and flashlight. 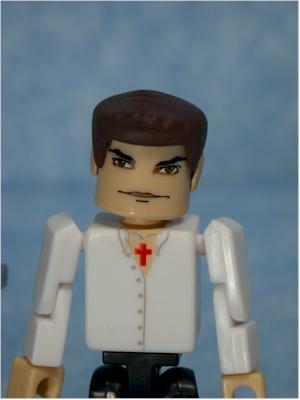 He also has a black jacket and arms for his transformation. And let's not forget that tombstone! 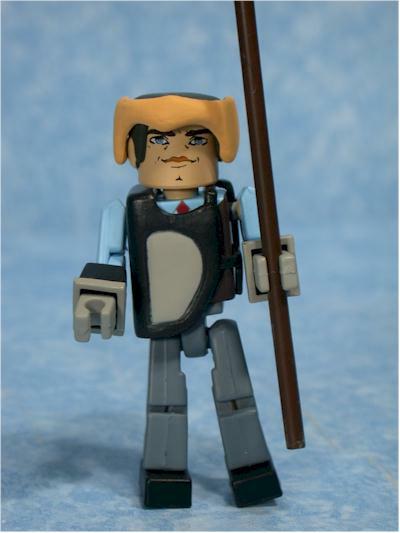 Giles comes equipped with Vampyr book, two bo staffs, and his tombstone. The rest of the parts are intended to turn him into 'training instructor' Giles, including a padded coat, head gear, cuffs, hands and arms. 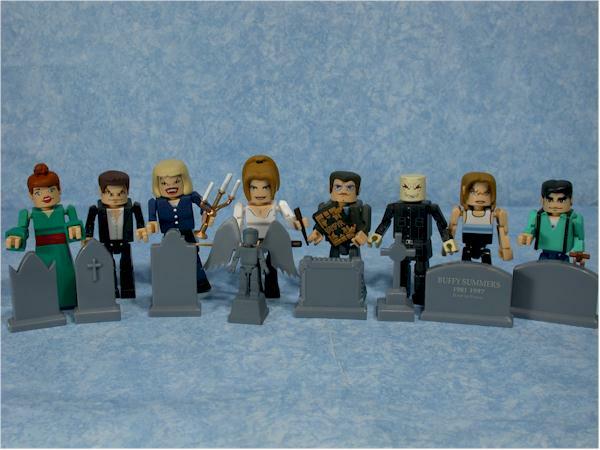 Finally, there's Vampire Buffy, who has those books again, along with a purse and a tombstone. Hers is the only one with writing on it, stating "Buffy Summers, 1981 - 1997, Rest in Peace". 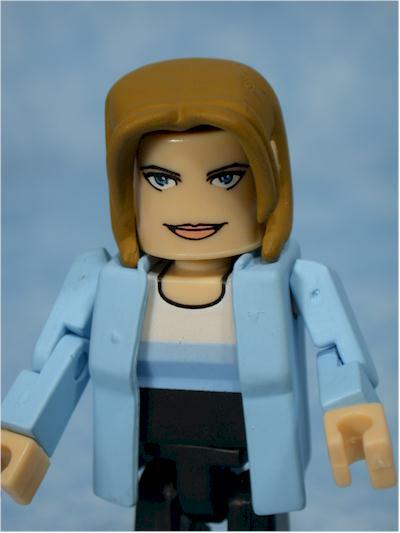 She also has the blue jacket and arms for her altered ego. 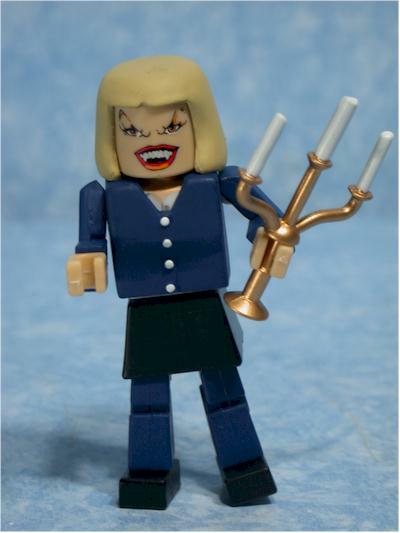 No, she never was really a vampire on the show, but appeared that way in the episode aptly titled "Nightmares". Most of the accessories are sculpted perfectly to fit the hands of any figure. That's a huge plus, making them much more useful. 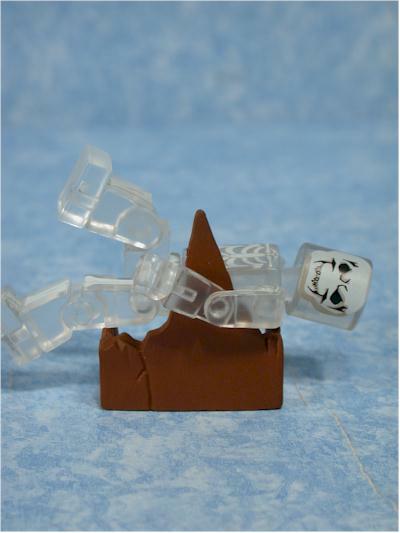 One of the coolest features on most mini-figures is their ability to be taken apart. This means you can pop heads, arms and torsos off and swap around, making all kinds of hinky combinations. 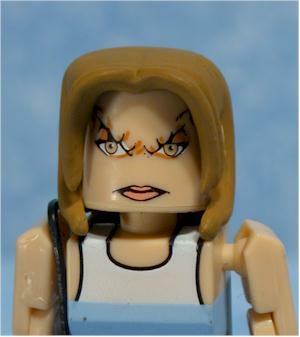 For most mini-figures though, it's just an amusing side effect of their design. Not so with the Buffy Palz, where Palisades has made this feature a major part of every figure. As I mentioned in the accessories, each figure comes with various extra body parts. Sometimes it's just a torso and some new arms to match, other times it's as extensive as a new head, legs and arms, like the Master. 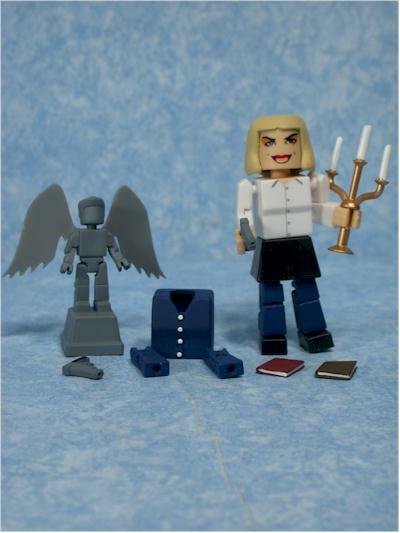 And sometimes, like with Angel, there are enough parts to make multiple versions of both Angel and Angelus. The transforming works easily - twist the head around to show the alternate face, pop off hands, arms, legs, whatever, and pop on the new pieces. While there's only one exact intended second version, you can make all kinds of your own versions with all the extra parts. There's a ton of possibilities! Each of these eight figures have specific versions they are supposed to transform into - Vampire Buffy switches back to normal Buffy, Angel switches to Angelus, Darla goes vamp, Willow gets the Asian treatment, the Master gets skinny, Giles gets ready to take a pounding, and Xander gets cool (a surprised looking cool, but cool nonetheless). This transforming feature is also a great sales ploy - sure, it seems like a great value since you can make two Willows for the price of one, but don't you want to have BOTH on display? Better pick up a second Willow! For Willow, Xander and Buffy, there is an answer - there's an exclusive boxed set of those three without all the cool accessories for about $18 from Sam Goody, Suncoast and Media Play. 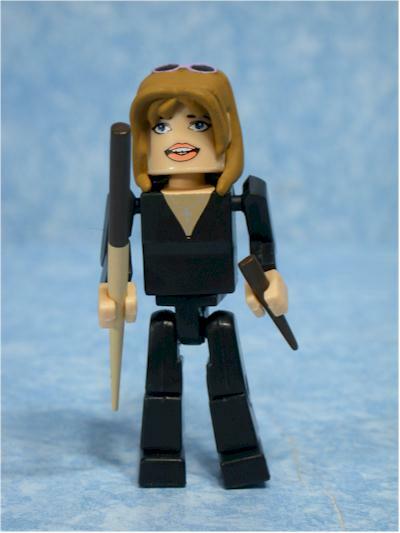 The big thing for mini-figures is that they should be FUN. Big fun. They are toys at heart, not statues to be displayed, but well articulated little figures to be played with. 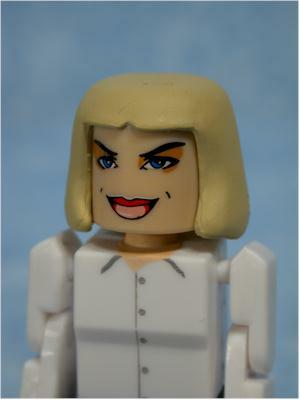 My favorite mini-figures of all time are Playmobil. These things simply rock. I bought two large sets for my kids this Christmas, their first foray into the Playmobil world, and I have had a great time setting up and building the intricate sets. That same flavor is what these Palz have. Oh, they aren't as complicated, and they are certainly better articulated, but they are going for that fun factor that Playmobil and Legos have. They haven't quite reached it, but they are a lot closer than most other mini-figures we've seen come out over the last couple years. One drawback might actually be their ability to come apart everywhere. As I mentioned, I had some trouble with a couple of them keeping their lower limbs attached at the knee, and I suspect a kid would get frustrated pretty quick if that was a regular occurrence. Still, these spell a ton of fun overall. I'm grading these at $10 each, which is a couple bucks too much for sure. The low production numbers on this stuff in the current market is really hurting the retail pricing, but there are some other options out there. I have some sponsors listed below that are selling these as cheap as $7 each, and at that price you can easily add another star. Considering two LOTR mini-mates cost $8 - $9 with few accessories, getting these around $7 is a solid deal. When I first picked up the three pack at Media Play - it was the first thing to hit shelves - I didn't think I was going to be too happy with the line. That exclusive set of Buffy, Willow and Xander doesn't include many of the accessories, and doesn't have the extra body parts for transforming, so it was fairly under whelming. I'm happy that I gave these a second look though, because the regular release figures are much better. There a tad expensive, but if you can pick them up for $7 - $8, you won't be disappointed. Not a thing this time around. However, if you're looking for the variant Darla (packed one per case of the regular assortment), she has a black sweater and arms, along with slightly different colored books. The quickest way to notice her though is that her vamp face is packaged in the visible position, whereas the regular Darla has the human face visible. - OMGCNFO.com has the best price I've seen at just $7 each for the regular figures! 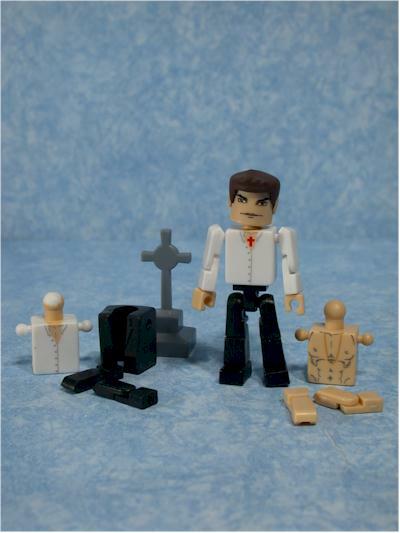 - Killer Toys has the individual figures available for just $8 each. - CornerStoreComics has the individual figures for $8, but many are sold out. However, they have the full set for $45, and the Angel exclusive for just $9! 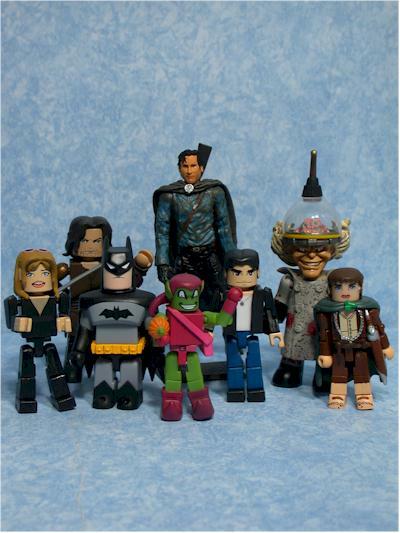 - Time and Space Toys has the set of six regular figures for $60, in stock. 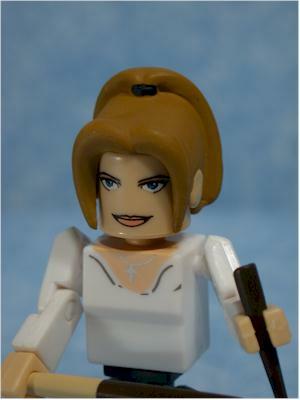 They also have a TON of additional Buffy merchandise, including the Diamond Select figures.